When discussing fiber and prebiotics, kidneys generally don’t come to mind. Foods rich in roughage are typically considered a means to facilitate regularity and to support cardiometabolic health by moderating blood sugar, cholesterol and weight. On the other hand, prebiotics tend to be utilized to “fertilize” healthy bacteria aka probiotics in our gut. However, in recent years, researchers have dramatically broadened their view about the potential of both of these dietary components. Preventing illness is always preferable to treating it. Two recent studies in the British Journal of Nutrition and the European Journal of Clinical Nutrition, both conclude that diets rich in fiber can significantly reduce the odds of developing chronic kidney disease (CKD). What’s more, several separate trials have found an inverse link between fiber-rich eating patterns and the formation of kidney stones. Two other important publications bear mentioning. First, a meta-analysis from 2014 reported that higher fiber intake is associated with protection against renal cell carcinoma or kidney cancer. Finally, a 2016 study published in the journal Advances in Medicine, revealed that a fiber- and nutrient-dense diet may decrease the likelihood of CKD progression. Practically speaking, this argues for the inclusion of more nutritious fruits and vegetables, rather than simply supplementing with oat bran, psyllium or other supplement sources. If you follow health and medical trends at all, you’ve surely noticed a plethora of coverage about the influence the gut microbiome imparts on many conditions and diseases. A systematic review from this year explains that prebiotics, probiotics and synbiotics (a combination of the two), appear to “reduce blood urea and serum phosphate concentrations”. 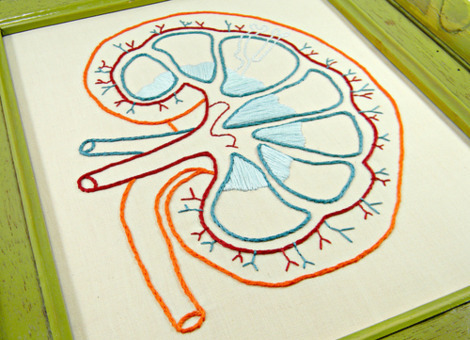 Healthy kidneys process urea (a waste product related to protein digestion) and phosphate (a mineral) without trouble. Unhealthy kidneys cannot and this can cause a variety of unwanted effects: bone loss, fatigue, frequent and/or painful urination, joint pain, restless legs and more. According to the authors of the paper, the noted reduction in phosphate and urea along with the dampening of oxidative stress and systemic inflammation may well “control the progression of chronic kidney disease”. A few intervention studies from 2018 bolster the thesis that addressing gut dysbiosis (imbalance of bacteria) via prebiotics not only protects the kidneys, but also improves renal function. Adding more dietary fiber and prebiotics offers yet another advantage: it tips the odds of avoiding diabetes in your favor. Diabetes is one of the leading causes of kidney damage and disease. There is one small caveat that requires consideration. If you’re not accustomed to consuming large amounts of fiber and/or prebiotics, it’s probably best to add them gradually to your daily routine. Additionally, if you have any type of digestive or gut-related condition, it may impair your ability to tolerate a fiber- and prebiotic-forward diet. This is especially true if your condition isn’t well controlled or if you’re in the midst of a flare up. If that’s the case for you, proceed with caution and medical counsel. For the rest of us, these two simple strategies look very promising for the kidneys and beyond. Asia Pac J Clin Nutr. 2017;26(4):598-605. Dietary fiber intake is associated with chronic kidney disease (CKD) progression and cardiovascular risk, but not protein nutritional status, in adults with CKD. BACKGROUND AND OBJECTIVES: Evidence suggests that dietary fiber benefits patients with chronic kidney disease (CKD); however, this conclusion requires further validation. In this study, we examined the effects of dietary fiber on kidney function, inflammation, indoxyl sulfate, nutritional status, and cardiovascular risk in patients with advanced CKD. METHODS AND STUDY DESIGN: We performed linear regressions to assess the association between dietary fiber intake and CKD parameters. The aforementioned parameters were compared over an 18-month follow- up period. Kaplan-Meier analysis was used to investigate the association between fiber intake and Cardiac vascular disease (CVD). RESULTS: In total, 157 patients were included in this study. Dietary fiber and inflammatory indices were associated (interleukin [IL]-6: β=-0.024, p=0.035). The differential estimated glomerular filtration rate (ΔeGFR) as well as levels of C-reactive protein, IL-6, indoxyl sulfate, and serum cholesterol in the higher fiber intake (>=25 g/day) group were lower than those in the lower fiber intake (<25 g/day) group (p<0.05). Differences in IL-6 and indoxyl sulfate levels were more significant in patients in the higher protein intake group (p<0.05). Dietary fiber intake may be a protective factor associated with CVD (hazard ratio=0.537 and 0.305- 0.947). The protein nutritional status was not different between the two groups (p>0.05). CONCLUSIONS: Our results suggest that increasing fiber intake can retard the decrease in the eGFR; can reduce the levels of proinflammatory factors, indoxyl sulfate, and serum cholesterol; and is negatively associated with cardiovascular risk, but does not disrupt the nutritional status of patients with CKD. J Ren Nutr. 2017 Nov;27(6):458-461. The Leaky Gut and Altered Microbiome in Chronic Kidney Disease. Chronic kidney disease results in disruption of the intestinal epithelial barrier as well as profound changes in the gut microbial flora. 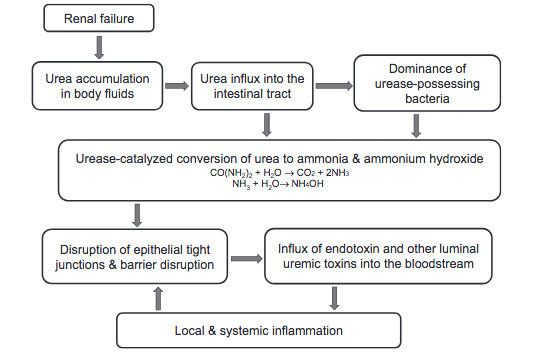 These events are largely mediated by (1) heavy influx of circulating urea to the gut lumen and (2) dietary restrictions of foods containing high fiber (such as fruits and vegetable) and symbiotic organisms (such as yogurt and cheese) imposed to mitigate hyperkalemia and hyperphosphatemia. Collectively, these factors promote systemic inflammation and cardiovascular morbidity by mediating microbial dysbiosis, disruption of the intestinal epithelial barrier, and translocation of endotoxin, bacterial fragments, and uremic toxins across the “leaky gut” into the bloodstream. Strategies aimed at increasing dietary fiber and lowering urea burden may help to attenuate uremia-induced microbial dysbiosis and epithelial barrier breakdown, and thereby improve systemic inflammation. Dietary Metabolites and Chronic Kidney Disease. Dietary contents and their metabolites are closely related to chronic kidney disease (CKD) progression. Advanced glycated end products (AGEs) are a type of uremic toxin produced by glycation. AGE accumulation is not only the result of elevated glucose levels or reduced renal clearance capacity, but it also promotes CKD progression. Indoxyl sulfate, another uremic toxin derived from amino acid metabolism, accumulates as CKD progresses and induces tubulointerstitial fibrosis and glomerular sclerosis. Specific types of amino acids (d-serine) or fatty acids (palmitate) are reported to be closely associated with CKD progression. Promising therapeutic targets associated with nutrition include uremic toxin absorbents and inhibitors of AGEs or the receptor for AGEs (RAGE). Probiotics and prebiotics maintain gut flora balance and also prevent CKD progression by enhancing gut barriers and reducing uremic toxin formation. Nrf2 signaling not only ameliorates oxidative stress but also reduces elevated AGE levels. Bardoxolone methyl, an Nrf2 activator and NF-κB suppressor, has been tested as a therapeutic agent, but the phase 3 clinical trial was terminated owing to the high rate of cardiovascular events. However, a phase 2 trial has been initiated in Japan, and the preliminary analysis reveals promising results without an increase in cardiovascular events. Beyond Sodium, Phosphate and Potassium: Potential Dietary Interventions in Kidney Disease. People with kidney disease are advised to restrict individual nutrients, such as sodium, potassium, and phosphate, in line with current best practice guidelines. However, there is limited evidence to support the efficacy of single nutrient strategies, and compliance remains a challenge for clinicians to overcome. Many factors contribute to poor compliance with dietary prescriptions, including conflicting priorities for single nutrient restriction, the arduous self-monitoring required, and the health-related knock-on effects resulting from targeting these nutrients in isolation. This paper reviews the evidence base for the overall pattern of eating as a potential tool to deliver a diet intervention in which all the nutrients and foods work cumulatively and synergistically to improve clinical outcomes. These interventions may assist in kidney disease management and overcome these innate challenges that single nutrient interventions possess. Healthy dietary patterns are typically plant-based and lower in sodium and animal proteins. These patterns may have numerous mechanistic benefits for cardiovascular health in kidney disease, most notably through the increase in fruit, vegetables, and plant-based protein, as well as improved gut health through the increase in dietary fiber. The evidence to date on optimal dietary patterns points toward use of a predominantly plant-based diet, and suggests its adoption may improve clinical outcomes in dialysis patients. However, clinical trials are needed to determine whether these diet interventions are feasible, safe, and effective in this patient population. Preliminary analysis of the effect of Stevia (Stevia rebaudiana) in patients with chronic kidney disease (stage I to stage III). Background: Stevia, Stevia rebaudiana (Bertoni), has become an important economic plant for its commercial use as a sweetener. Stevia plays a significant role in the healthcare practice of different cultures and in population. Previous animal and clinical studies demonstrated the efficacy of Stevia against chronic diseases like diabetes and hypertension. This study aimed to investigate the beneficial effect of Stevia in chronic kidney disease (CKD) patients after three (3) months of treatment along with the conventional antihypertensive and anti diabetic medications. Methods: A prospective, interventional, randomized, single-blind, placebo-controlled trial has been done with 97 participants. Stevia capsule (250 mg) or matching placebo was given to the participants twice daily along with Angiotensin-II Receptor Blocker (ARB) and/or Ca2+ Channel Blocker (CCB). First follow up visits were done after 3 months of the interval. Blood and urine samples were collected for the biochemical tests. A structured questionnaire was used for the baseline assessment. Informed consent was taken from each participant. Results: Both hypertension and diabetes were found to be associated with CKD. Most of the participants (52.3%) of Stevia group were in CKD Stage II. Significant changes were found in Serum creatinine (p < 0.027), Serum Uric acid (p < 0.009), Fasting blood sugar (p < 0.041) and Postprandial blood sugar (p < 0.013) and Microalbumin (p < 0.041) level in the treatment group. Conclusion: The initial result demonstrated that Stevia has the potential for a significant improvement of some biochemical parameters in CKD patients. After completion of the nine (9) months clinical trial, the constructive effect of Stevia can be confirmed in this group of patients. Nephrology (Carlton). 2018 Oct;23 Suppl 4:16-20. Diet, gut microbiome and indoxyl sulphate in chronic kidney disease patients. Emerging evidence suggests that intestinal dysbiosis plays an important role in host inflammation locally and systemically. Such pathological condition is even more prevailing in patients with chronic kidney disease (CKD). Of note, indoxyl sulphate (IS), a gut-derived uremic toxin, is notorious for its pro-inflammatory feature in CKD patients. IS accumulates in the body as the urinary excretion of uremic toxins is impaired, and further worsens the kidney function in a vicious cycle to CKD. Dietary restriction in vegetables, fruits and yogurt leads to the predominance of indole-producing intestinal microbial flora and further exaggerates the accumulation of IS in CKD patients. Recently, interventional studies have shown that circulating IS can be reduced by dietary prebiotic and/or probiotic supplements. However, further randomized controlled trials are warranted to examine whether such beneficial effect of dietary prebiotic/probiotic supplements could be extrapolated to better hard outcomes in CKD population. In this review, we would also like to emphasize the importance of achieving sufficient intake of dietary fibre by proper vegetable pre-treatment and accurate fruit selection, instead of directly avoiding these potassium-rich yet fibre-rich and base-producing foods. Biomed Res Int. 2018 Nov 1;2018:3061742. Coconut Water: An Unexpected Source of Urinary Citrate. Purpose: Coconut water has long been touted for its medicinal qualities including natural hydration. We sought to determine whether its consumption would induce changes to urinary lithogenic factors beyond changes in urine volume. Materials and Methods: After Institutional Review Board approval, volunteers with no prior history of nephrolithiasis were recruited. Each participant was randomized initially to either the coconut water or the water phase of the study. Participants kept meticulous food and fluid intake logs during the first phase of the study and were asked to replicate that diet for the second phase. For each phase the participant consumed 2L of either Taste of Nirvana® pure coconut water or tap water daily for four days. Participants were not restricted to consume additional fluid of their choice during their assigned study phase. During days 3 and 4 of each phase the participant collected a 24-hour urine specimen. Coconut water citrate and malate content were measured and were used along with the beverage pH to calculate the total alkali content of the coconut water. Supersaturation levels were calculated using Equil2. Nonparametric paired analysis using the Wilcoxon test was performed for statistical analysis. Results: There were 4 adult male and 4 adult female participants. Each individual’s 24-hour urine collection had a creatinine excretion within 20% of the mean for each subject’s four samples corroborating that all samples were collected properly. The two samples from each phase for each individual were averaged. The coconut water itself was also analyzed and it was calculated to have a total alkali content of 13.8 mEq/L. Consumption of coconut water significantly increased urinary citrate (29%, p=0.02), urinary potassium (130%, p=0.01), and urinary chloride (37%, p=0.03), without affecting urine pH (p=0.16) or volume beyond that of tap water (p=1.00). Conclusions: Coconut water consumption increases urinary potassium, chloride, and citrate in nonstone forming individuals.